Well, when one is drawing, or drafting especially, it is useful, if not necessary, to have a ruler. And one might think that all rulers are the same. But they’re not. 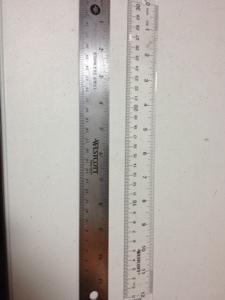 Some rulers have uneven edges, or mis-marked inches. A cheap ruler might cost half a dollar, and a good one might cost a full dollar. It’s not much difference and definitely worth it. The Westcott rulers that I have here are very functional, durable, and standard. Then have straight edges and correctly marked inches. One is clear acrylic and the other is steel. I use the steel for inking and the clear for sketching. I would recommend two rulers for that reason. And these are flexible, and the markings are wear-resistant. My only real complaint would be that the acrylic ruler scratches a bit too easily. This sounds much more like a recommendation than a review, and it is, sort of. It’s a no-brainer to get a ruler. Getting a good one is not much more expensive than a cheap one, and these work great, they’re some of the best I’ve used. This entry was posted in Tools and tagged acrylic, clear, plastic, review, ruler, rulers, steel, westcott by Dragon Co (Austin Smith). Bookmark the permalink.